After the plane-party made their way to the hotel, it didn't take long for word to start circulating about the backstory behind The Statement. For the whole context, the journo who posed the question -- the National Catholic Reporter's John Allen -- has provided a full transcript of the session, only the second press conference of the current pontificate. Q: Can you say something to us about your sentiments and your hopes with which your approach this trip, and what your fundamental objectives are? 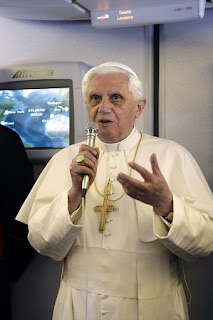 Benedict XVI: My trip has basically two objectives. 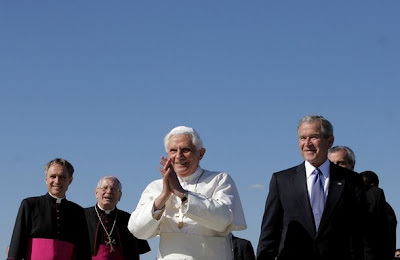 The first is a visit to the church in America, in the United States, and naturally also the entire country. There’s a particular motive, which is that 200 years ago the Archdiocese of Baltimore was elevated as a metropolitan archdiocese, and at the same moment two or three other dioceses were created … Philadelphia, Boston, Louisville. It’s a great jubilee for the church in the United States. It’s a moment of reflection on the past, but also on the future, on how to respond to the great challenges of our time that will present themselves in the future. Q: Holy Father, I’ll ask my question in English. I know you will speak principally in Italian, but we would be grateful for at least a few words in English. The Catholic church in the United States is large and dynamic, but also suffering, above all because of the recent sexual abuse crisis. The American people are waiting to hear what you have to say on this subject. What will your message be? 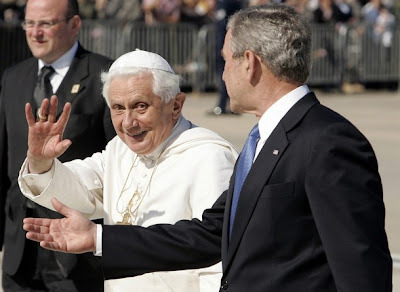 Benedict XVI: It is a great suffering for the church in the United States, for the church in general, and for me personally that this could happen. If I read the histories of these victims, it’s difficult for me to understand how it was possible that priests betrayed in this way their mission to give healing and to give the love of God to these children. We are deeply ashamed, and we will do all that is possible that this cannot happen in the future. Q: I’ll ask the question in Italian, but we would love to have just a greeting in Spanish. With the enormous growth in the Hispanic presence, the Catholic church in the United States is becoming steadily more bilingual and bicultural. Yet there’s also a growing “anti-immigrant” movement in America. Do you intend to invite the United States to welcome immigrants well, many of whom are Catholic? 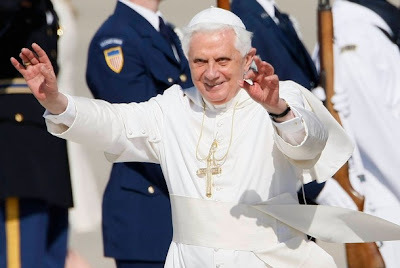 Benedict XVI: Unfortunately I’m not ready to speak in Spanish, but I offer a greeting and blessing for all the Spanish-speakers! Certainly I’ll talk about this subject. I recent had the ad limina visit from the bishops of Central America, also South America. I saw the scope of this problem, above all the grave problem of the separation of families. This is truly dangerous for the social, human and moral fabric of these countries. Providing an added "oomph" to the immigration part of the Pope's comments, B16's farewell on Sunday will come courtesy of 1,500 immigrants from the diocese of Brooklyn, who'll don native garb, pray and sing in 23 languages as they see the pontiff off at JFK Airport. Beyond being one of global Catholicism's great melting pots, the 1.7 million-member diocese is also home to the first formal outreach to immigrants established by a local church. Brooklyn's Catholic Migration Office was founded in 1970, months after a motu proprio of Pope Paul VI urged improved pastoral initiatives to aid "all those who, like Christ exiled in Egypt with the family of Nazareth, are compelled to move in lands far from their home."